Soft soil deposits usually have a low bearing capacity and undergo excessive settlement over a long period of time. Using such materials either as a foundation medium or construction material is almost impossible without some means of improving their adverse properties. This study deals with an overview of the dredged soil stabilization generated by dredging the flood spill channel of Jhelum River, Srinagar. But concern over environmental affects of dredging, disposal and the increasing unavailability of suitable disposal sites, has put pressure for characterization of this material. Thus, disturbed and undisturbed samples of dredged soil from different locations of flood channel were collected for conduct of various field and laboratory tests for determination of physical and mechanical properties as per relevant standard procedures. On the basis of geotechnical investigations, it has been observed that dredged soil is composed of silt, sand, clay and organic matter, all important components of topsoil, which is not suitable as a construction material in its in-situ condition. Therefore, an attempt has been made to study some physical and mechanical properties of cement stabilized dredged soil for its utilization in bulk in various geotechnical applications. The soil-cement mixing is adopted to improve a soft clay foundation, which provides stability during the construction stage. Test specimens were prepared with dredged soil using a range of cement (by dry weight of the soil) at 0.95γdmax and optimum moisture content and subjected to different tests as per relevant standard procedures. On the basis of geotechnical investigations, it is observed that there is significant improvement in the mechanical behaviour of cement stabilized dredged soil. 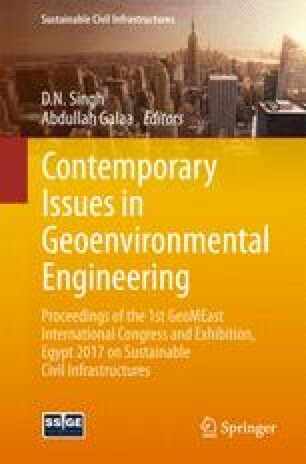 Thus the main objective of present study was a two fold-first, to overcome challenges posed by dredged soil and second, to adopt its economical and environmentally beneficial utilization in various geotechnical applications as a construction material.